I found this in the LA Times today - and plan on making it for dinner later this week (will post pictures). I'm a fan of chorizo; one of my favorite finds is a Chorizo y Garbanzo recipe. I eat is as often as my sensitive stomach will allow. "Almost anyone can make a great dish out of luxury ingredients. It takes a special kind of genius, though, to make something from scraps. But that's what frequent contributor Sarah Karnasiewicz did in her story on hash. Grab some onions, potatoes, leftover meat and flavorings and with a little bit of technique and a lot of creativity, you too can make something delicious. 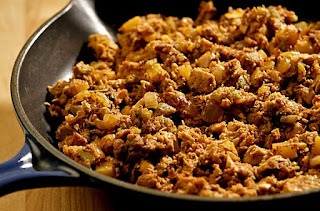 You'll have a hard time bettering this hash made from chicken, chorizo and green chile though. It's hearty and soul-satisfying and just the thing to take the chill off a winter night." Since some of us are still having those colder "winter" nights....and even though I haven't done this one myself yet I still had to share. 1. Melt 1 tablespoon butter in a large skillet, preferably cast iron, over medium heat. Add the onion and garlic and cook, stirring occasionally, until the onion is soft and slightly browned, about 5 minutes. Add the chorizo and chicken, and cook until the chorizo is cooked through, about 4 minutes. Season to taste with salt and pepper. Remove the mixture from the pan and set aside. 2. Wipe out the skillet and heat the remaining butter over medium heat. Add the potatoes, cover and cook without stirring until browned and beginning to crisp around the edges, about 5 minutes. Add the chiles, stirring them into the potatoes, then re-cover and cook until the potatoes are well browned, about 4 minutes longer. Stir the chicken and chorizo mixture into the skillet, then drizzle over the cream, paprika, and oregano. Stir to combine, scraping up any crusty bits from the bottom of the pan. Remove from heat, season with additional salt and pepper to taste. Top with chopped green onions and serve.